Fresh mushrooms are soft, edible fungi that are earthy in flavour. While there are many kinds grown in the wild, not all of them are safe to eat. 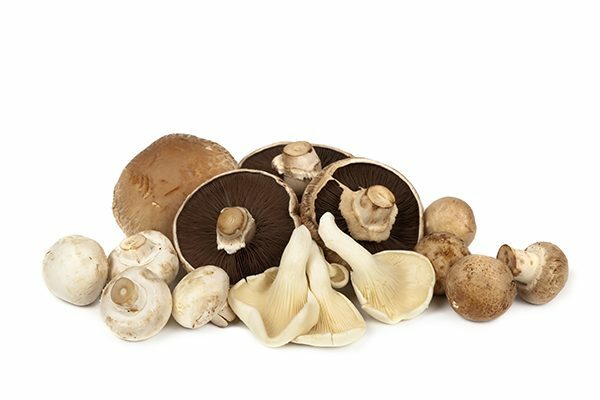 Canadian mushrooms that are available in grocery stores are always safe to eat, and there are lots of options to choose from. Different varieties will boast different complexities in flavour: some have more umami, some seem to melt away as you eat them, while others have a hearty and meaty texture. Try them all to see which ones you like best. 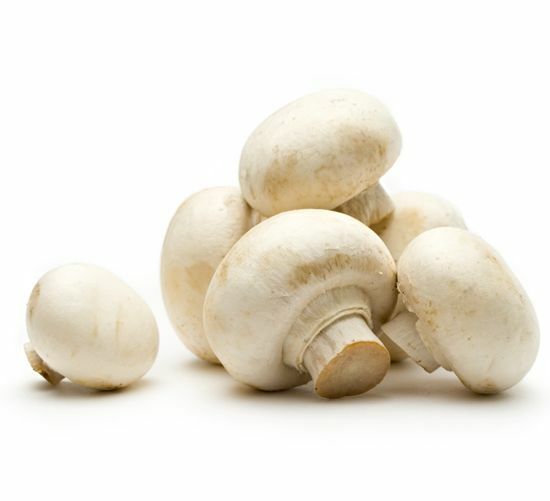 White mushrooms are the most popular in Ontario. They have an earthy flavour that intensifies with cooking. The colour of them varies from bright white to a darker off-white colour. They are available in three different sizes: small “buttons”, medium-sized or large “jumbo”. Best Cooking Methods: Serve in soups, salads, appetizers, and entrées; can also be eaten raw. Cremini mushrooms are like the white mushrooms in shape and size, but are firmer in texture. They have a meaty, earthy flavour that is more intense than the white “button” variety. These have a dark cap that ranges from a light tan to a rich brown colour. Best Cooking Methods: Serve in soups, salads and entrées, or enjoyed raw. 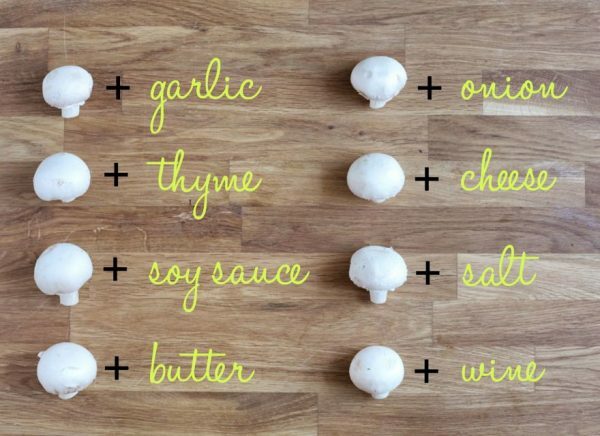 These are a great substitute for white mushrooms. Portobello’s are a fully-grown cremini mushroom. They have less moisture than them, making portobello’s meatier in texture with a strong, earthy flavour. They have a large, light-tan coloured cap, and exposed gills. Portobello’s are the largest of all domestic mushrooms. Best Cooking Methods: Can be grilled or baked and used in appetizers, side dishes and entrées. Portobello’s are great meat substitutes because of their natural umami flavour and meaty texture. Shiitake mushrooms have very different appearance and texture than white or cremini. They have a soft, spongy texture that releases a woodsy flavour when cooked. They range in colour from tan to dark brown. They have umbrella shaped caps, 2 to 4 inches (5 to 10 cm) in diameter, with open veils and tan gills. Best Cooking Methods: This variety is most commonly used in stir-fry and pasta dishes. They are best enjoyed cooked. Oyster mushrooms have a delicate flavour that is milder than others. They have a light to dark brown funnel or fluted cap, a velvety texture, and white-yellow gills on a short, off-center, stem. Best Cooking Methods: Because of the velvety texture, they make a great compliment to dishes featuring chicken, seafood and pork. Enoki mushrooms look very different from the others on this list. They can be identified by their long, slender, white stems with tiny firm caps. They have a mild, delicate flavour, with a slightly crunchy texture. Best Cooking Methods: These are most commonly used in Asian dishes but are also suitable for salads, soups, sandwiches and pasta. They can be eaten raw or cooked. King Oyster mushrooms are pleasantly chewy, with a texture that remains firm when cooked. These thick stemmed fungi have a light tan cap, white stem, and a sweet woodsy flavour. Best Cooking Methods: Slice and use in stir-fry dishes, or sautéed in French, Italian or Mediterranean cuisines. Also try grilling them, as they become golden brown and deliciously crisp. 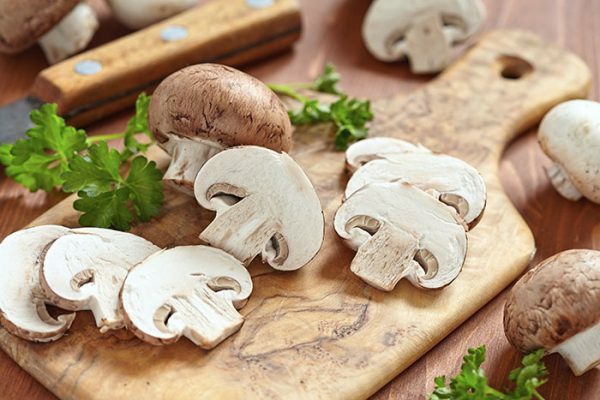 Select fresh, firm, even-shaped mushrooms with no bruises or visible moisture on the outside. Avoid buying slimy mushrooms. When buying them loose, try selecting ones that are close to the same size to ensure similar cooking times. Store them in a brown paper bag in the fridge to maintain their taste and texture. If buying packaged mushrooms, check to make sure there is no excess moisture inside the package. Packaged mushrooms keep well in the refrigerator, but once opened they should be transferred and stored in a brown paper bag, as they will breathe better and stay firm longer. Mushrooms are best when used within a few days of purchase, but can be kept in the fridge for up to one week. Clean mushrooms just before you are about to use them. To clean them, gently brush away the dirt (which is peat moss) with a soft brush or wipe with a paper towel and trim any stem ends. Contrary to the myth that you cannot wash mushrooms, if they’re really dirty, you can give them a quick rinse in cold water and pat dry. Soaked mushrooms may add a small amount of water but they’re already high in water content so cleaning them doesn’t make too much of a difference. The most noticeable difference is that it may take an extra minute or two for them to release their juices before they start to brown. If you are cooking with Shiitake mushrooms, remember that they have a tough stem that needs to be removed. Other varieties typically have tender stems and can be left intact. After being cleaned, mushrooms can be chopped, sliced, grated, torn or left whole. They can be enjoyed raw or cooked. You may be familiar with the term “don’t crowd the mushrooms.” To brown mushrooms, it’s recommended that you cook them in smaller amounts so they will have more space in the pan to release their water content, which will evaporate. Cooking large batches will also yield this result provided you cook them longer and do not disturb the mushrooms’ contact with the heat. Once mushrooms release their water content, they will shrink and then brown. Be patient and let them brown before stirring. To Sautee: Heat 1 tablespoon of olive oil in a large skillet. Add 8 ounces of mushrooms, and stir until all of their juices have evaporated. To Butter Steam: Cut mushrooms lengthwise into ¼ inch slices. Butter-steam up to 5 cups of mushrooms at a time by using 2 tablespoons of butter or margarine. Cook for 3 to 4 minutes over medium high heat, stirring occasionally to allow the mushrooms to steam and cook off their moisture and to acquire even browning. To Grill: Use button, brown, or shiitake mushrooms. Cut off tough stem ends. Thread smaller mushrooms on skewers. Brush with oil, butter or margarine. Grill for about 10 minutes. To Microwave: Cut 1 pound of mushrooms lengthwise into ¼ inch slices, or into halves or quarters. Place in a microwave-safe dish. Dot with 6 tsp of butter or margarine. Cover and microwave on high for 4 to 6 minutes, stirring after 2 minutes. Let stand, covered, for 2 minutes. To Stir-fry: Cut mushrooms lengthwise into ¼ inch slices, or into halves or quarters. Stir-fry up to 5 cups at a time, using 1 tablespoon of oil, for 3 to 4 minutes. To Freeze: Mushrooms: simply clean and slice them, and then place them carefully in a freezer bag. Blanching makes them tough, and is unnecessary if you intend to freeze them for less than 3 months. If you plan to freeze mushrooms for a longer period, sprinkle them with lemon juice diluted with water and then blanch them for 2½ minutes. Add them to recipes from frozen. Have a lot of mushrooms to slice? An egg slicer is a fun way to slice mushrooms and it cuts the work in half. Also, try using the slicing wheel attachment in your food processor to slice mushrooms quickly. If a recipe calls for finely chopped mushrooms, try grating them instead. 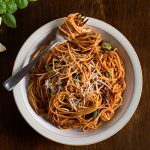 Use this technique to incorporate the great flavour of mushrooms into dishes like meatloaf and pasta sauce. This is an easy way to serve mushrooms to fussy eaters since it’s almost impossible to know that they are there. Mushrooms must release their juice to brown. Cook mushrooms over medium heat until they begin to release their liquid, then turn the heat to high until the liquid has evaporated. At this point the mushrooms will sizzle and begin to brown. 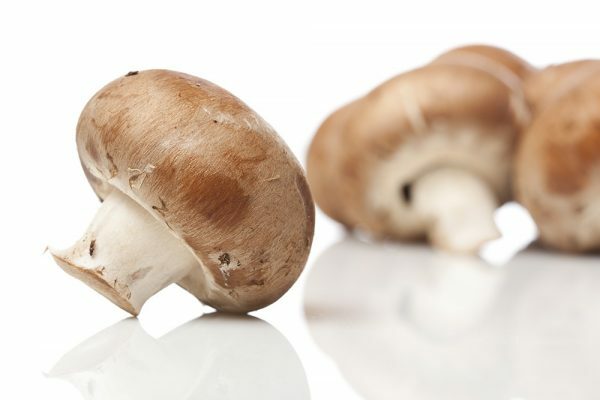 Did you know that Portabella mushrooms have as much potassium as bananas do? Did you know that Mushrooms are grown year-round in Canada? This is because mushrooms are grown in the dark; in climate-controlled buildings. The ideal growing conditions for mushrooms (dark, humid and damp) are kept constant in these buildings throughout the entire year. Therefore, local production and harvesting of the six varieties of fresh mushrooms occurs year-round. It is recommended that you enjoy dried mushrooms within one year. 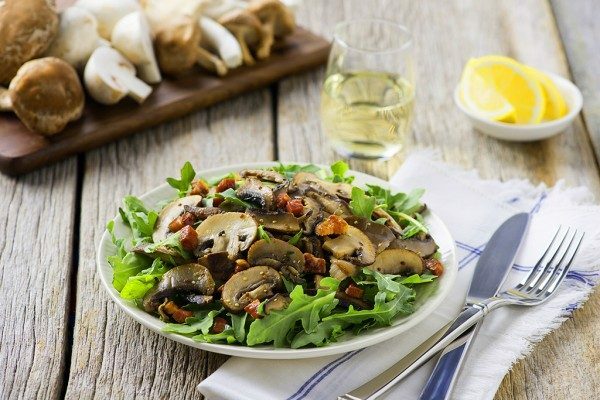 There are many ways to enjoy mushrooms in every meal from breakfast to dinner. Try butter-steaming mushroom slices to add to omelettes, or use as topping for steaks and hamburgers. 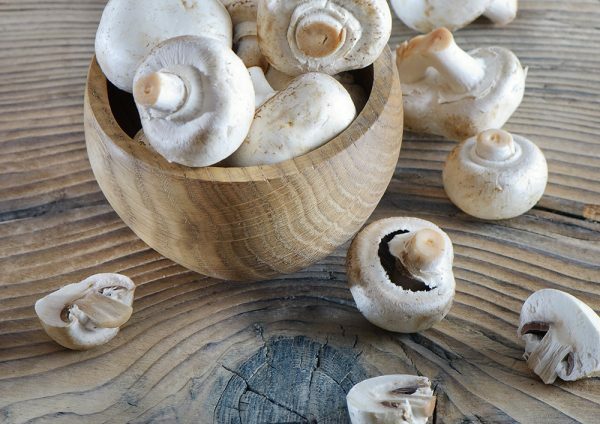 Offer raw, whole medium-sized mushrooms with a dip for an appetizer, or slice and add to green salads or soups. You can also make stuffed mushroom caps for a special appetizer or meal. Large portabellas can be marinated and grilled to be used as the ‘burger’ for a meat-free dish. 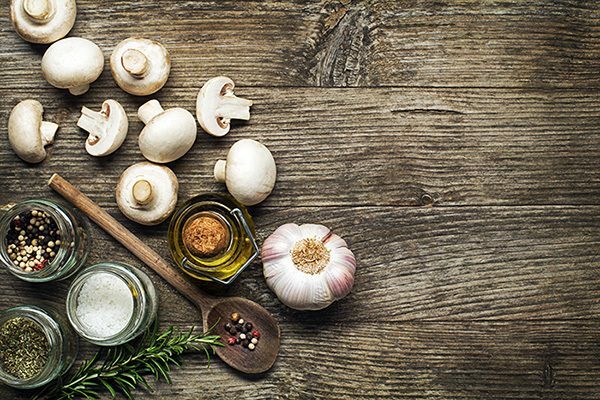 Add a combination of mushrooms to pasta, salad, gravies or sauces, to add a complexity of flavour to your meal. Using a mixture of different kinds of mushrooms also makes a delicious soup. Use mushrooms for vegetarian or vegan dishes to add a meatiness and umami taste, like in this shepherd’s pie or this risotto. Mushrooms can also be combined with beef in recipes to increase the serving of vegetables in a dish, add volume to meals and extend portions. 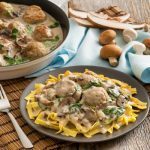 Try serving creamy mushroom turkey meatballs over pasta or rice, for lightened up take on the classic Italian dish. Mini mushroom sliders are a perfectly portioned party food. 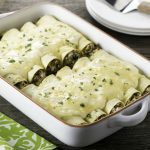 Finely chopped mushrooms blend extremely well with ground beef in dishes like Mushroom Meatball Subs, Cheeseburger Quesadillas and Sloppy Joes. It also works very well in pasta dishes like Spaghetti Bolognese and Cheesy Mushroom Beef Skillets. 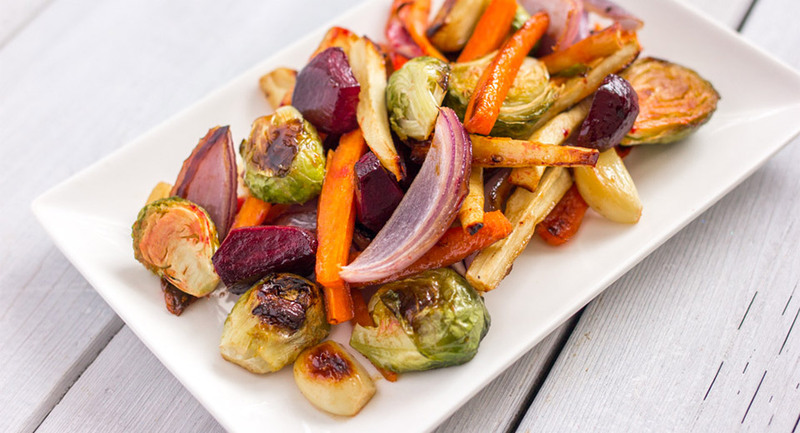 This veggie is packed with nutrients! Four to five medium sized mushrooms (approx. 100 g) provide important vitamins and minerals, essential for a healthy body and active lifestyle. According to the Canadian Nutrient File, 100 g of mushrooms contain a great number of your daily-recommended intake of nutrients 25 calories, no cholesterol, almost no fat, 1 gram of fiber, 25% of riboflavin, 21% of pantothenic acid, 19% of selenium, 16% of copper, 9% of potassium, 8% of phosphorus, 6% of vitamin B6, 4% of vitamin D, and 4% of vitamin C.
Check out our Mushrooms Video too!